So I’ve been sharing some of my favourite not-too-sweet recipes, in response to my recent post on sugar (and why I’m glad natural sweeteners are expensive, because it keeps us from eating too much sugar). Anyway, here’s another recipe to add to the list — and for once, it’s not chocolate! I am proud to say that I came up with this recipe all on my own. It’s inspired by risotto, if you want to know, adapted to create a sweet (but not too sweet) pudding. 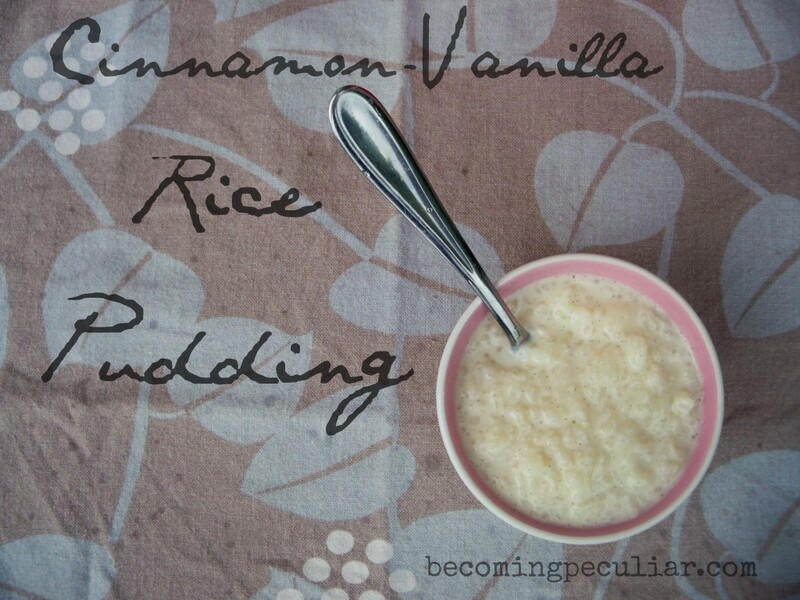 I’d never made a satisfactory rice pudding before I came up with this one. It felt like I was just making runny pudding with rice floating around in it for no apparent reason. 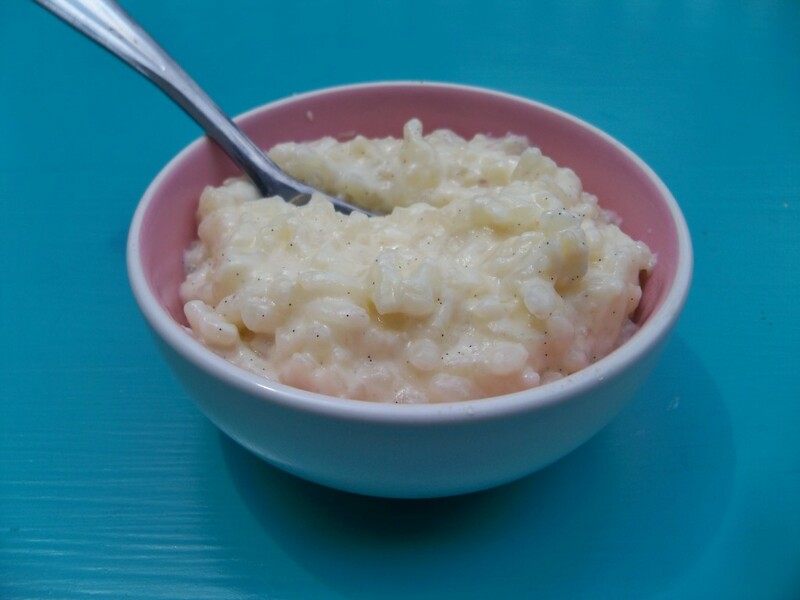 One day it dawned on me that I could achieve the same beautiful creaminess of risotto if I followed the same basic principles: start with arborio rice, sauteed in oil; then slowly add the liquid and stir, stir, stir until the rice releases all of its wonderful starch to create a rich, creamy pudding. I played with the spices until I discovered perfection, in the form of a whole cinnamon stick and a half a vanilla bean. Oh my goodness, you guys. These two little flavour punches will knock your socks off. (Okay, they knocked my socks off. Maybe you don’t like perfection.) Plus, the sight of those beautiful black specks (i.e the vanilla bean seeds) will impress your friends and make you look like a real foodie. Anyway, here’s the recipe I came up with. I’ve included substitutions if you don’t have a cinnamon stick and vanilla bean on hand. I’ve made it at least a dozen times, with or without the fancy spices. You’ll be amazed how far four tablespoons of sweetener go in this super-flavourful pudding. I prefer the texture of Arborio rice, but I imagine regular white rice would work, too. In a large saucepan heat oil over medium heat; stir in rice to coat. 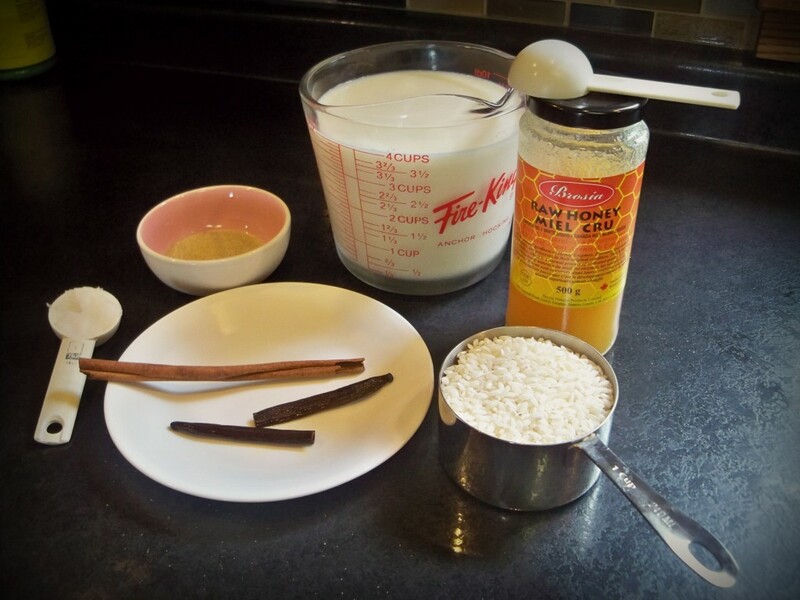 Stir in milk, sugar, vanilla bean (if using), and cinnamon stick; slowly bring the mixture to a gentle boil. Simmer for 30 minutes, stirring constantly (more or less — you can stop and do other things in the kitchen, but don’t wander too far), until most of the milk is absorbed and rice is tender. It should be nice and creamy. Remove from stove and allow to cool for a few minutes. Fish out the cinnamon stick and vanilla bean. (Be sure to scrape out all the delectable vanilla bean seeds with the tip of a sharp knife and stir them into the pudding.) Stir in raw honey and vanilla extract (if using). Pour into individual serving dishes and refrigerate until cool and firm, about an hour. Look at those beautiful vanilla bean seeds. They make this dish so rich and flavourful, and will impress your friends. Have you tried anything similar? 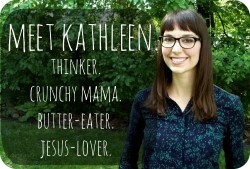 Again, do you have any not-too-sweet dessert recipes to share? Have you ever mailed rice pudding in the oven? That is how I have always made it. It never is runny, but firm. I would have never thought of cooking it on the stove. Oh! No, I’ve never tried it that way! It sounds like a great idea! I love rice pudding in theory (and when I get it at Indian restaurants) but my own versions always fail. I’ll have to give yours a try! Rasmus’ family have rice pudding as their Christmas dessert but they serve it cold, with chopped almonds stirred through and cherry compote on top.